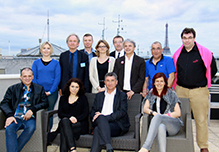 On the 5th and 6th of April, 360 people took part in the ELA General Assembly and Families/Researchers Conference at the Novotel Vaugirard hotel in Paris. Guy Alba, ELA President and founder, Christine Doublé, General Secretary and Pascal Prin, Treasurer, presented the association’s annual report, activity report and financial report before speeches from Gunther Forstner, President of ELA Germany which was created in 2013 and Rie Honma, President, and Ai Honma, Treasurer, of the Japanese association A-Future, regarding the probable upcoming creation of ELA Japan. There were then eight scientific workshops where researchers presented their work, discussed their results and answered questions from the families. As each year, this highpoint of ELA’s year was full of emotion, sharing experiences and exchanges between the families, researchers, speakers and the ELA teams. The actors Ludovic Baude, Dounia Coesens, Michel Cremades, Lea François, Cecilia Hornus, Thierry Ragueneau and Valerie Vogt and the singer Merwan Rim – all ELA patrons – made a surprise appearance towards the end of the General Assembly to talk about their commitment to the association and spend moments full of warmth with the families. At the same time, for the second year running the employees of the hotel took part in the “Put on your trainers at work” initiative, counting their steps to help the association in its daily battle with illness. At the gala dinner, Jennifer Gosse, the representative of the Novotel Vaugirard hotel gave Guy Alba a cheque for 1,754.72 €.